How and when to prune Apple trees is something that confuses and scares many a novice gardener. It shouldn't do, because it is so simple. 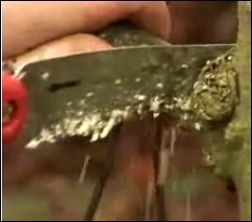 Of course, there are specialist methods to all pruning techniques and you can get into it deeper if you want to. In the meantime, if you have an Apple tree and do not know how to get started then I suggest you take a look at this cracking little starter video. Tom Cole, head of landscaping at Capel Manor shows you the basics of pruning an Apple tree. Open the full post for the video.